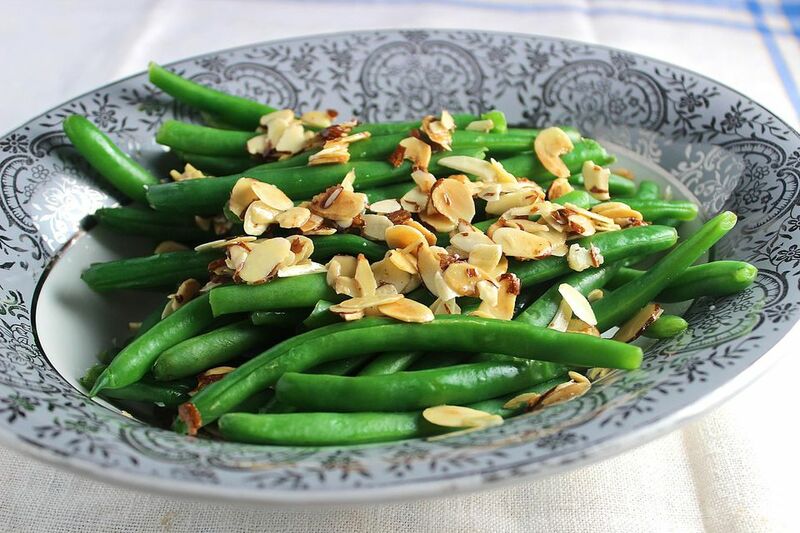 This simple and delicious side dish recipe for green beans amandine (green beans with almonds) is perfect for just about any meal or occasion. Also, it is popularly called green beans almondine. This is a classic French dish—haricots verts amandine—quite simply meaning "green beans with almonds." The key here is to not mince your terms. You want to prepare your green beans "French-style" not "French cut." French cut is a distinct culinary term meaning to cut the entire length of the green bean from top to bottom, sheering it half lengthwise. You do not want to do that (although you can if you want). For this recipe, all you need to do is just snip the rough ends off the tips off of each green bean. This dish is very easy to make and the perfect complement to everything from roasted chicken and grilled steak to hamburgers and Thanksgiving dinner. Amandine is a culinary term that indicates that a dish is cooked with almonds. Dishes prepared this way are usually cooked with butter and seasonings, then sprinkled with whole or flaked, toasted almonds. Amandine is often spelled "almondine" in American cooking. Other popular dishes that are prepared amandine include potatoes, fish, and asparagus. Trim the beans, cutting off a small part of each end. Look over the beans, discarding beans that are wrinkled, limp, or have soft spots. Rinse the beans well and pat dry. In a heavy saucepan, place the green beans in cold water to cover and bring to a boil over high heat. Reduce the heat to low and simmer for 8 to 10 minutes or until the beans are crisp-tender. Drain well and set the beans aside. Melt the butter and olive oil in the same saucepan and add the garlic and almonds. Cook over medium heat, stirring constantly until the almonds begin to brown. Add the beans along with the lemon juice, salt, and pepper and toss gently to coat. Serve immediately. Frozen beans: You can also use frozen green beans; cook them according to the package directions, then drain. Melt butter, add garlic and almonds and continue with the recipe. For garlic lovers: For a more intense garlic flavor, you can take an extra step to roast some garlic. Cut the top 1/3 off garlic heads, exposing the cloves. Place the garlic in a foil-lined baking dish cut side up. Pour olive oil over the garlic and season with salt. Fold up the foil to seal and create a tight packet. Bake in the oven until a paring knife inserts easily into the center of a garlic clove, about 1 hour. Toss the roasted garlic cloves into the dish at the end. Cheesy garnish: A couple ounces of crumbled blue cheese works surprisingly well as an added flavor profile for this dish.